Place eggs in medium bowl. Mash eggs with potato masher until evenly mashed. Stir in cheese, mayonnaise, paprika, salt and pepper. Stir in bacon. 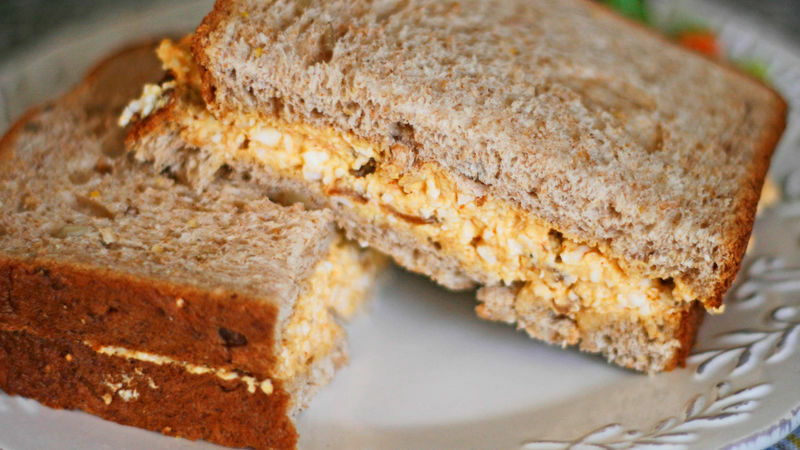 Spread egg mixture on each of 4 slices bread. (I like 12-grain). Top with remaining bread. Make your hard-cooked eggs in advance (I usually make them a day ahead) so that they are cooled and ready to go. You can also purchase already hard-cooked eggs at some grocery stores, near the eggs natch. If you like a chunkier egg salad, mash 5 of the eggs and chop the sixth. Cover and refrigerate leftover egg salad up to 2 days.